The villages of Barbote and Pyang are located in neighboring districts in the far west region of Nepal. Despite many similarities between the villages, their citizens receive remarkably different levels of public services. Residents of Barbote, who farm rice for their livelihoods, are confident that they can find a crop extension agent when they need one, and a third of them have within the past year. Anuj, the official in charge of agricultural extension services for Barbote’s district, provides these services with a staff of only five agents serving over 82,000 farmers. However, Anuj has lived in the district for 24 years and deeply understands local agricultural conditions; he also leaves the district capital for field visits at least every other week. By contrast, Bishal, the district officer who oversees extension for Pyang’s district, has more than double the ratio of crop extension agents to farmers. Yet Bishal knows little about the community he serves; he has lived there for less than two years and cannot recall his last field visit outside the district capital. When asked the best way to expand agricultural production in his district, Bishal could not name a single policy area. Though citizens there depend as much on rice cultivation for their livelihoods as those of Barbote, all surveyed Pyang residents reported that no crop extension agents serve their village. These examples, from two real (but anonymized) villages in Nepal, highlights a broader puzzle. In developing countries, access to public services by the rural poor is often limited. Yet despite shared socio-economic characteristics and geographic proximity, the actual levels of services in rural villages can vary considerably.Weak state capacity is often blamed for this combination of poor and uneven service delivery. Yet, since capacity manifests unevenly across space and sectors, identifying the reasons for the variability, and thus which specific elements of capacity are more likely to enhance service delivery, is not straightforward. In our new paper, we derive a measure of subnational capacity in the agricultural sector and show how it affects access to agricultural extension in rural Nepal. What are the key elements to ensuring access to extension services? We found that the number of extension agents, staff professionalization and bureaucratic autonomy matter surprisingly little in shaping rural households’ access. Instead, the local knowledge and intrinsic motivation of individual agricultural bureaucrats play a far greater role. Extension services are crucial for adoption of new agricultural technologies in developing countries. Approaches to extension are extremely varied, ranging from the military-led extension program in Uganda to smaller-scale NGO-supported programs, like the Volunteer Farmer Trainers in East Africa. 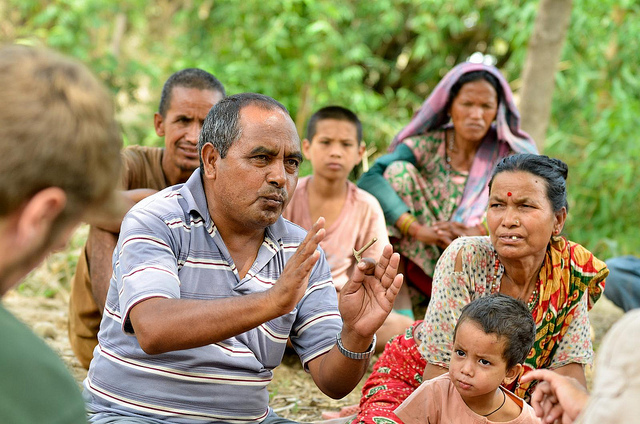 In Nepal, there is a policy of “One Extension Agent, One Village” that aims to provide public extension services uniformly across the country, even though this has proved difficult to achieve in practice. Our findings were based on a nationally-representative survey of over 1,000 rural households in 48 of the country’s 75 districts, interviews with 50 District Agricultural Development Officers (DADOs) — the bureaucrats in charge of agricultural extension in a district — and semi-structured interviews with high-level agricultural policymakers in Nepal. It’s not all about resources! We examined access to agricultural extension services from our household survey in three ways, including whether a household 1) reported an extension agent serves their area, 2) actually received extension services in the last 12 months, and 3) specifically received public extension services during that period. We then constructed a measure of state capacity that included five different components: Staff resources; staff education; bureaucratic autonomy (measured by how often local politicians get involved in policy planning); local knowledge, including years served in a given village and whether the majority of agents are from the district they serve; and intrinsic motivation — the degree to which district agricultural bureaucrats are personally motivated to make a difference in the lives of villagers. These dimensions of capacity showed very low correlations with each other, highlighting how multifaceted the concept is and how any efforts to build capacity should consider potential trade-offs. We found that the local knowledge and motivation of DADOs are much more important predictors of agricultural extension access than the other three components. Specifically, each additional year that a DADO has lived in a district is associated with a six percent increase in the probability that a household receives governmental extension services. When a majority of the extension agents that a DADO oversees are from the local area, there is a 33 percent increase in the probability of receiving any extension services. This makes intuitive sense, since extension services demand location-specific information on technology, soil fertility and farming practices, which increases the informational complexity of the task and requires a high level of local knowledge and embeddedness. In addition, DADOs with higher levels of motivation are associated with a 58 percent increase in the likelihood that a household receives any extension services. The relevance of local knowledge and intrinsic motivation for extension access is particularly significant given that transferring is a common means of rewarding political loyalty (or sanctioning disloyalty) in Nepal. In fact, 70 percent of the DADOs in our sample had lived in their assigned districts for less than two years at the time of our survey. Therefore, one important implication of our findings is that reducing rotations of district agricultural bureaucrats is a low-cost but high-impact approach for improving extension services. Another is that more effort is needed to uncover why some bureaucrats are more motivated than others and whether managerial training or incentives for career mobility may make a difference. These observations by no means suggest that governments in Nepal and elsewhere should not invest more in hiring extension staff and ensuring those staff have sufficient resources to reach agricultural households. However, it does show that even when agricultural budgets are constrained, there are still other innovative means to improve service provision. Future research should consider ways in which agricultural service provision in rural areas can not only improve the livelihoods of the poor but also build legitimacy for the state, which is especially important in fragile and largely agrarian democracies like Nepal. This post was written by Danielle Resnick, a Senior Research Fellow at the International Food Policy Research Institute (IFPRI), Development Strategies and Governance Division, and Jordan Kyle, a Non-Resident Fellow at IFPRI. This post also appears on AgriLinks blog. This study was supported by the U.S. Agency for International Development (USAID) through the Policy Reforms Initiatives Project in Nepal and through ReSAKSS-Asia. Funding was also provided by the CGIAR Research Program on Policies, Institutions, and Markets (PIM), which is led by IFPRI and funded by CGIAR Trust Fund contributors.